William Morris was born in Carmel, California, in 1957, and received his degrees from California State University at Chico and Central Washington University. 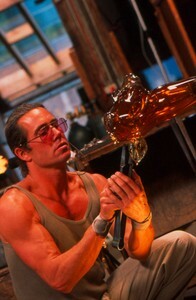 He is considered to be one of the most gifted and innovative glass artists in America today. Morris retired from the glass art profession several years back but his work is still collected enthusiastically by both private glass collectors and museums. He currently lives on the Big Island of Hawaii. William Morris glass artist began his art glass career working first as a driver, then an assistant and finally the chief gaffer for Dale Chihuly. 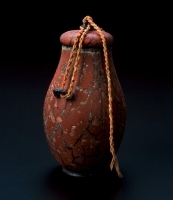 William Morris’ glass artwork has been strongly influenced by his interest in archaeology and ancient pagan cultures, and addresses the timeless relationship between humans and their environment. His work evokes images from a time when man was more in tune with nature, and is subliminally suggestive of ritual significance. 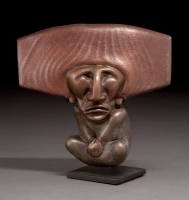 Various works such as the Stonehenge Series, Artifact Vessels, Suspended Artifacts, and Rhyton Vessels illustrate symbolical, mythological influences. He also acknowledges the influence of Italian artists who have shared their knowledge of techniques for crafting glass, so essential to the realization of Morris’ ideas into form. Another unique aspect of William Morris’ glass art is his treatment of surface texture, achieved by various techniques such as sprinkling powdered glass and minerals onto a blown surface, etching, and acid washing to achieve “ancient” and textural diversity. As well as a master glassblower, William Morris is considered to be a revolutionary and provocative artist, whose work goes beyond mere craftsmanship to touch the souls and primal consciousness of it’s viewers. William Morris glass sculptures are part of the permanent collections of many museums, including the Metropolitan Museum of Art, the Museum of Arts and Design, the Chrysler Museum of Art, the Louvre, the Victoria and Albert Museum and the Musee des Arts Decoratifs.